With a birthday in February, sometimes it is a little while before I get to play with my presents. 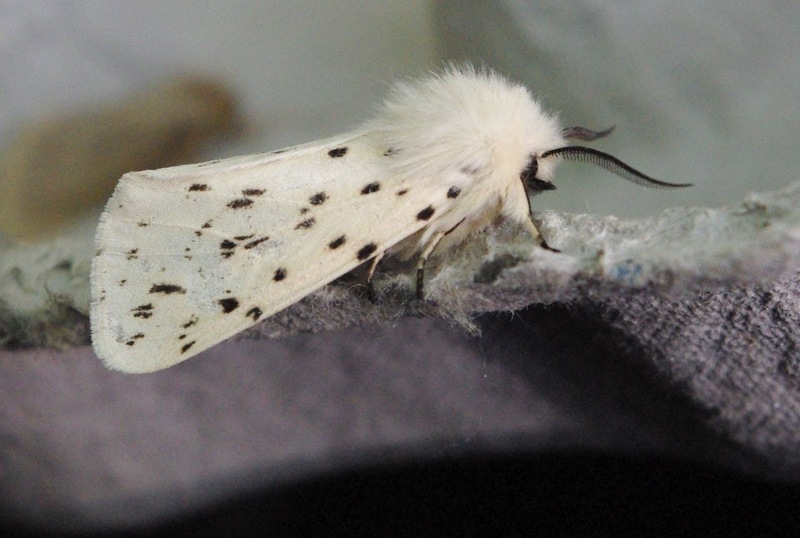 This weekend saw the first excursion for my new Robinson Mercury Vapour moth trap, after a long, damp spring and then improving weather that didn’t coincide with a Saturday night/Sunday morning. Setting up the trap was pretty straight forward and in no time at all it was in position and warming to full attraction intensity as the last of Saturday’s sunlight disappeared over the north-western horizon. Not rising as early as I would have hoped, there had been ample chance for a few of the entrapped to escape into the bright, warm morning before the sun rose too high in the sky, though when I lifted the lid and explored the egg boxes I had laid at the base of the trap I was not to be disappointed. 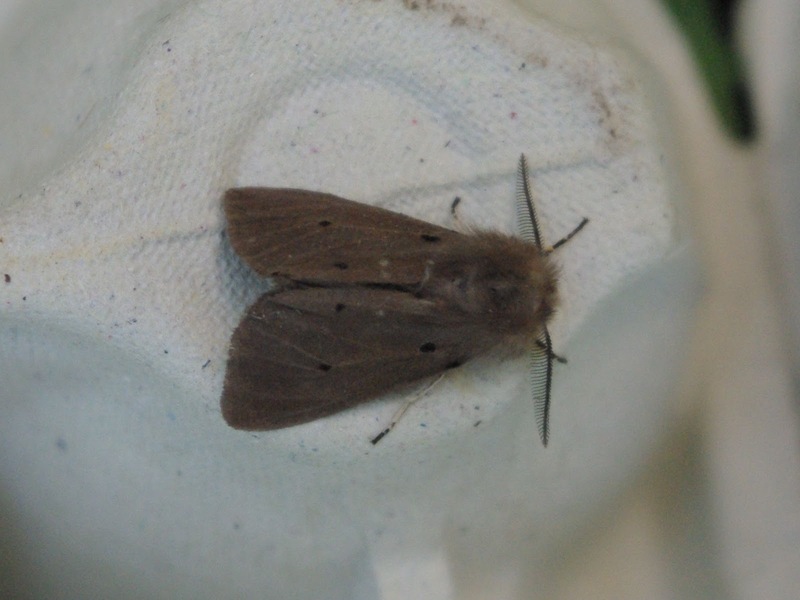 In fact, rather dramatically, the first moth I came across was one of the largest found in these isles. 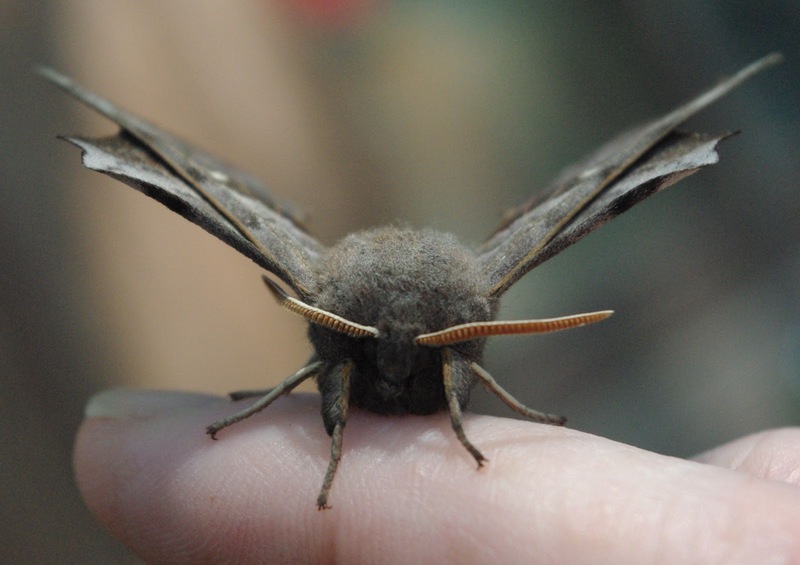 The Poplar Hawk-moth, Laothoe populi, is some 2.5 – 3.5 inches in wingspan with a large, quite bulbous body that arches in a peculiar stance quite different from other moths. The moth was extremely well behaved and tolerated being lifted around for photographs as well as a short and somewhat risky moment on the ferret cage wall before spending the day suspended from a tree branch – completely invisible were you not aware of its existence. 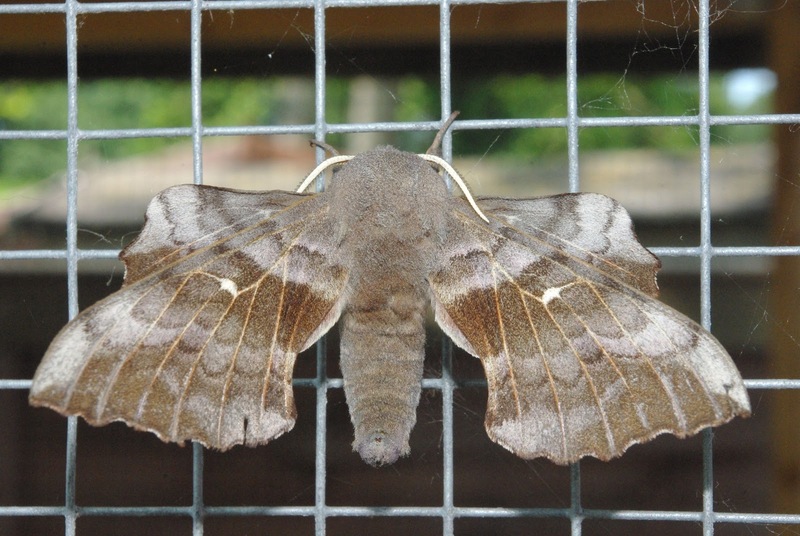 The Poplar Hawk-moth is probably the most common of our hawk-moths, though this is clearly a relative term. Indeed I’m not sure I have had the pleasure to study one up close before. At rest it thrusts its hindwings in front of its forewings, flashing rufous patches in the hindwings if disturbed. 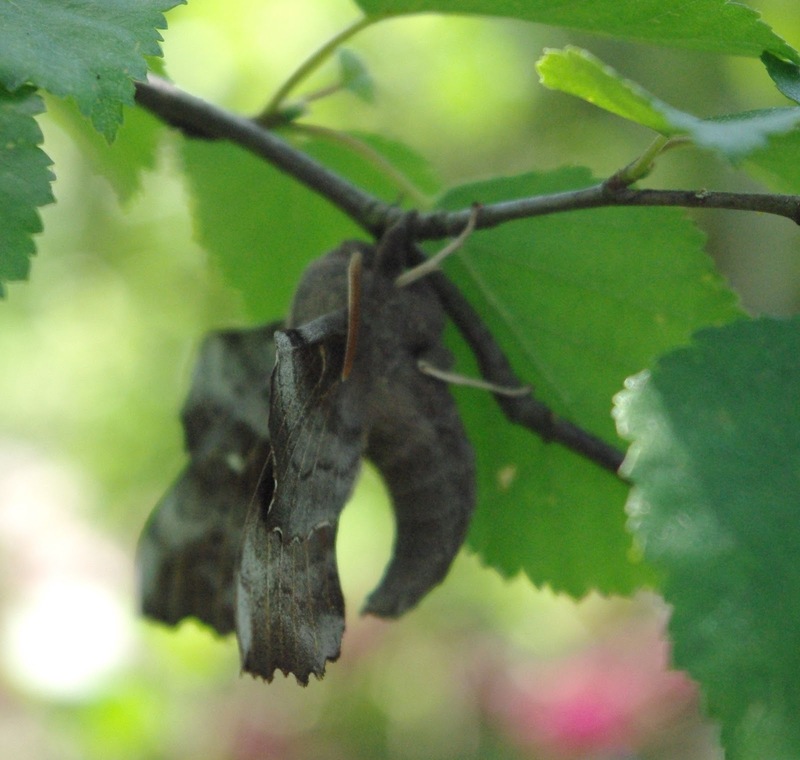 The Poplar Hawk-moth’s larvae feed on poplar (from whence it gets it’s name, aspen and sallow. 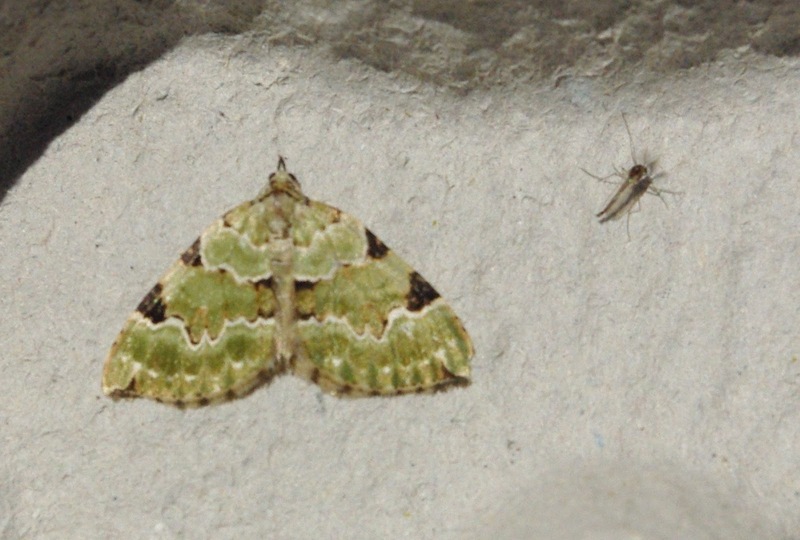 The rest of the visitors to our first setting of the moth trap included a delicately patterned Green Carpet Moth colostygia pectinataria as well as a male muslin moth and a pretty ermine moth, spilosoma lubricipeda, which according to Rothampsted Research data has seen a 77% decline in numbers in the last 35 years. Colostygia pectinataria, Diaphora mendica, Ermine moth, Green Carpet moth, Laothoe populi, Muslin moth, Poplar Hawk-moth, Spilosoma lubricipeda. Bookmark.